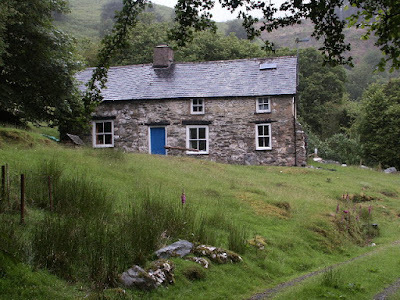 RAWIllumination.net: Oz Fritz on the feeling of being "home"
Bron-y-aur. Bron-y-aur Cottage near Machynlleth, Wales. Where Jimmy Page and Robert Plant wrote many classic songs for the third and fourth Led Zeppelin albums. Wikimedia Commons photo by "Andy." "Like many adolescents, I felt alienated and disconnected from current social expectations and the conventional cultural milieu; any sense of a real kind of home becoming distant, especially after moving out of the parental pod immediately upon turning 16. Whenever I listened to Led Zeppelin back then, and still to this day, I felt closer to being at home. A lot of good music in general invokes the home space, the place of sanctuary." What do you want to bet that wherever Robert Anton Wilson lived, he made sure to have some Beethoven LPs? Last night, I listened to one of my favorite Tom Petty albums Let Me Up (I've Had Enough) in my living room, enjoying the music but also feeling sad. I left home at the young age of 14.One night while relaxing in some random spot I could crash for the night I had my discman playing the Grateful Dead's Fillmore West 1969 and remember thinking that no matter what happened, I would feel at home with my headphones on. Also listening to Tom Petty currently.